SCVHistory.com LW3352 | Film-Arts | Loretta Young and Don Ameche in 'Ramona' (20th Century Fox, 1936). Loretta Young, Don Ameche in "Ramona"
Loretta Young as the title character and Don Ameche as her lover Alessandro in the 1936 version of "Ramona" from 20th Century Fox. BW 8x10 copy print of publicity photo. The 1936 film version of "Ramona" with Loretta Young and Don Ameche is a good reminder that 1939's "The Wizard of Oz" and "Gone With the Wind" weren't the first color moving pictures. 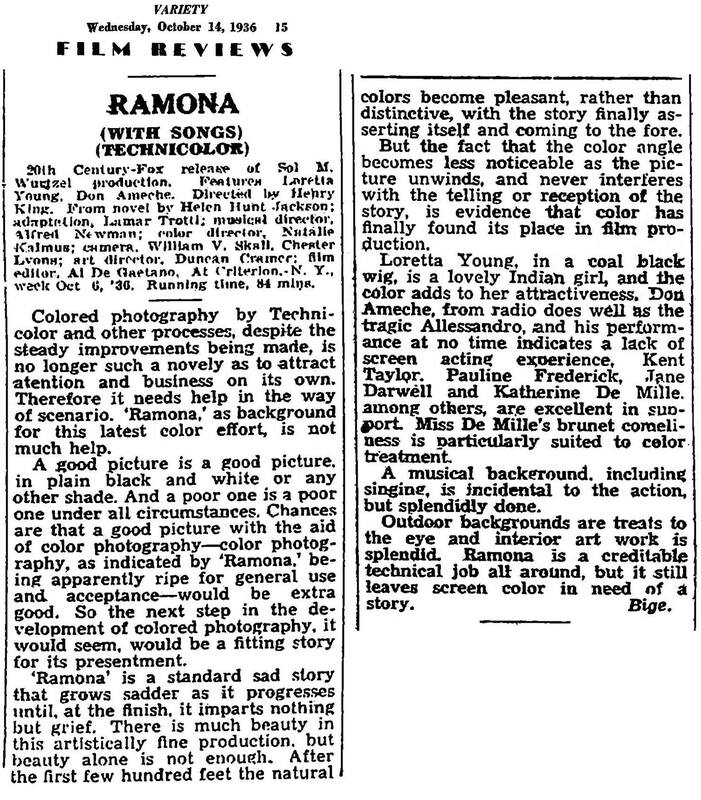 At 20th Century Fox, the first film produced in full three-strip Technicolor was "Ramona." That might have been all it was good for. The critics weren't impressed. They liked the color, but they thought a movie nonetheless needed a better plot than the mincemeat five different screenwriters made out of the blockbuster 1884 Helen Hunt Jackson novel. This first talking version of "Ramona" didn't live up to the standard set by the original 1910 short (1-reel) version starring America's sweetheart, Mary Pickford, with the pioneering direction of D.W. Griffith and camera work of Billy Bitzer, whose combined work had invented the fade-in/out and the closeup. The 1910 version stands up today among historians, considering it was shot at the "original" location of Rancho Camulos and was the first movie known to have been made in the Santa Clarita Valley. Perhaps audiences were expecting the creative storytelling of Edwin Carewe's 1928 version with the exotic Dolores del Rio. And talk about an afterlife. The only surviving copy of the 1928 film told a story of its own as it was whisked from Prague to Nazi Germany to the Soviet Union and ultimately to the Library of Congress where it was restored and duplicated and is now shown on special occasions at Rancho Camulos. Variety (Oct. 14, 1936) panned the 1936 Darryl Zanuck-Sol Wurtzel production, saying Technicolor couldn't stand on its own. It still needed help from good screenwriting. And "'Ramona,' as background for this latest color effort, is not much help," Variety said. "A good picture is a good picture, in plain black and white or any other shade. And a poor one is a poor one under all circumstances." One would think "Ramona" would be a good candidate for color, Variety said, because the Jackson story was well-known and liked. But this stinker was just "a sad story that grows sadder as it progresses until, at the finish, it imparts nothing but grief." Directed by Henry King, the 1936 version was in production from May 11 to June 29, 1936. 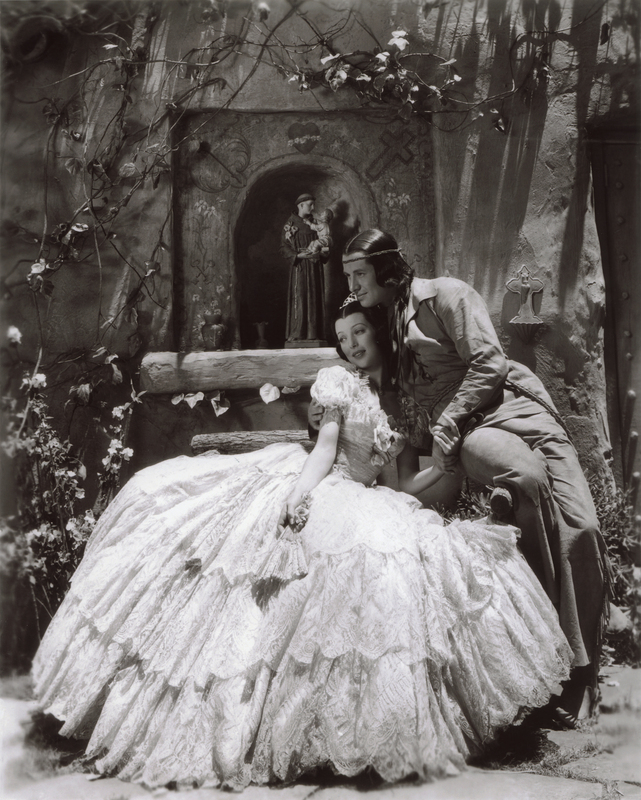 Zanuck promised "80 percent exteriors," so most of the shooting was done at Warner Hot Springs and the Mesa Grande Indian Reservation in San Diego County. Numbered among the cast were descendants of people Jackson is believed to have met during her visits in the early 1880s. 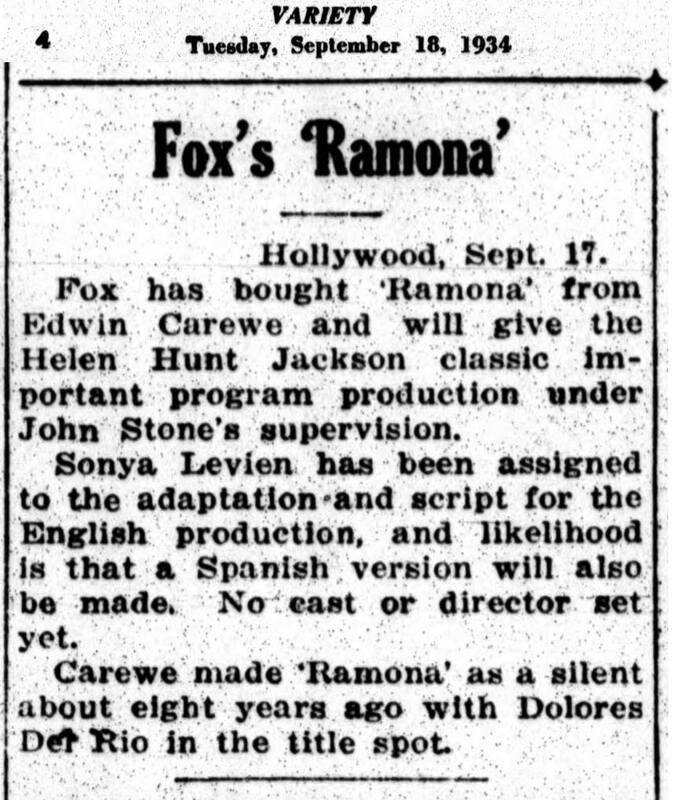 Fox had purchased rights to the story from Carewe in 1934 (prior to Fox's 1935 merger with Twentieth Century), according to a notice in Variety (Sept. 18, 1934). Rita Hayworth was originally cast as "Ramona," but Zanuck wanted Young for the part. Zanuck intended to start filming straight away, but production stalled in 1935 when Young, 22, suddenly "took ill." In truth, she was off having Clark Gable's baby. (Gable, 34, was married to another woman.) Young gave birth at home in Venice, Calif., to a daughter, Judith Young, on November 6, 1935. The child's parentage was a "Hollywood secret" for decades. After all, you really can't hold up production to have a baby with a man you're not allowed to marry when you're supposed to be starring in a movie about woman who has a baby with a man she's not allowed to marry, can you? Who would believe it? LW3352: 9600 dpi jpeg from copy print purchased 2018 by Leon Worden. Research assistance by Tricia Lemon Putnam.